A stop-loss order is a tool used by traders and investors to limit losses and reduce risk exposureMarket Risk PremiumThe market risk premium is the additional return an investor will receive (or expects to receive) from holding a risky market portfolio instead of risk-free assets. The market risk premium is part of the Capital Asset Pricing Model (CAPM) which analysts and investors use to calculate the acceptable rate. With a stop-loss order, an investor enters an order to exit a trading position that he holds if the price of his investment moves to certain level that represents a specified amount of loss in the trade. By using a stop-loss order, a trader limits his risk in the trade to a set amount in the event that the market moves against him. For example, a trader who buys shares of stock at $25 per share might enter a stop-loss order to sell his shares, closing out the trade, at $20 per share. This effectively limits his risk on the investment to a maximum loss of $5 per share. If the stock price falls to $20 per share, the order will automatically be executed, closing out the trade. Stop-loss orders can be especially helpful in the event of a sudden and substantial price movement against a trader’s position. 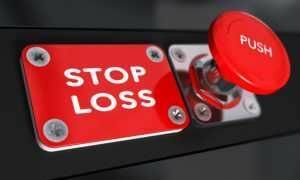 Stop-loss orders can also be used to lock in a certain amount of profit in a trade. For example, if a trader has bought a stock at $2 a share and the price subsequently rises to $5 a share, he might place a stop-loss order at $3 a share, locking in a $1 per share profit in the event that the price of the stock falls back down to $3 a share. It’s important to understand that stop-loss orders differ from limit orders that are only executed if the security can be bought (or sold) at a specified price or better. When the price level of a security moves to – or beyond – the specified stop-loss order price, the stop-loss order immediately becomes a market order to buy or sell at the best available price. Therefore, in a rapidly moving market a stop-loss order may not be filled at exactly the specified stop price level, but will usually be filled fairly close to the specified stop price. But traders should clearly understand that in some extreme instances stop-loss orders may not provide much protection. For example, let’s say a trader has purchased a stock at $20 per share and placed a stop-loss order at $18 a share, and that the stock closes on one trading day at $21 a share. Then, after the close of trading for the day, catastrophic news about the company comes out. If the stock price gaps lower on the market open the next trading day – say, with trading opening at $10 a share – then the trader’s $18 a share stop-loss order will immediately be triggered because the price has fallen to below the stop-loss order price, but it will not be filled anywhere close to $18 a share. Instead, it will be filled around the prevailing market price of $10 per share. With limit orders, your order is guaranteed to be filled at the specified order price or better. The only guarantee if a stop-loss order is triggered is that the order will be immediately executed, and filled at the prevailing market price at that time. The main purposes of a stop-loss order are to reduce risk exposure (by limiting potential losses) and to make trading easier (by already having an order in place that will automatically be executed if the market trades at a specified price). Traders are strongly urged to always use stop-loss orders whenever they enter a trade, in order to limit their risk and avoid a potentially catastrophic loss. In short, stop-loss orders serve to make trading less risky by limiting the amount of capital risked on any single trade. Trade Order Timing Trade Order Timing - TradingTrade order timing refers to the shelf-life of a specific trade order. The most common types of trade order timing are market orders, GTC orders, and fill or kill orders.